"Life is what happens to you while you're busy making other plans," right John Lennon? I have been sitting here for the better part of thirty minutes (wasting Nate's nap time being completely unproductive! ), staring at my computer screen, checking twitter, checking facebook, checking my google reader AND ignoring this here bloggity blog blog because I don't know what to say. When I get out of the habit of blogging, it feels like THIS BIG THING. And then I feel guilt about not writing a blog post or not posting pictures. I know it might be a little silly but I miss not putting it out there and connecting when it's been a few days. But I also don't want to s(ch)mear some words out there that are sad and tired. Cause that is a little bit how I feel today - sad and tired. Maybe it's the weather (cold and rainy here in the dirty south). Maybe it's the fact that Karl has been in Manhattan all week for work and I never sleep as well when he's gone. Maybe it's the fact that Nate has a vampirey tooth poking through and is low grade and cranky about it. Maybe it's just the long and dreaded month of FEBRUARY. Maybe it's that I sometimes feel my words aren't always articulate enough for this here blogosphere. Some days I think it's just okay to occasionally be gloomy (and eat a lot) and not have a "real" reason. So, I am just going to chalk up today as ONE OF THOSE DAYS (mama said. mama said.) and spend the rest of naptime writing some personal emails to my friends and family to reach out and say WELL HELLO THERE! because they might be having a bit of a gloom and doom day as well. What else should I do to perk up? What do you do? Retail therapy? TV therapy? Bath therapy? Workout therapy? 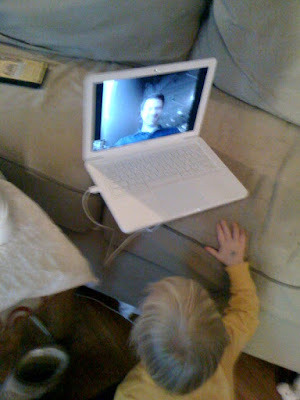 Skype therapy? Sleep therapy? Acupuncture? Maybe I should try it all. I sooo relate. You are awesome - rocking the baby, taking care of a household of BOYS and taking care of yourself. Nothing a little Dixie Cafe cannot cure. Hang in there! xoxo. I have been having some gloom as well. The sitting around the house sick is not very fun. Looking forward to hanging out soon. Hey and we can go to Dixie Cafe if you like. I love that place. ew, girl, i've been here. i can honestly sympathize 100 percent. husbands need to be at home, not far away.